I’ve been meaning to look into the guard gem for a while now. After falling out of love with ZenTest/Autotest, and switching back and forth between watchr and autotest-standalone, I’ve had a few friends who recommended giving guard a try. 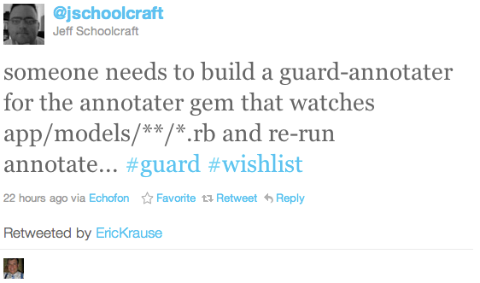 Last night, one of those friends retweeted a request for a guard plugin to work with the annotate gem. I figured that was good a cause as any to finally dig in and give guard a try. What better way to begin using and understanding a gem, then by writing an extension for it? About two hours later, I released the first versions of guard-annotate on rubygems.org (source code on Github). So, if you use the annotate gem on your rails projects, as well as guard, feel free to give the gem a try and save your self some time re-running your annotations. As always, comments and questions, as well as pull requests for features and bugfixes are welcome. guard-annotate has now been officially added to the main guard repository on GitHub. You can still install the gem the same way, but now you can also find the codebase on the guard page at GitHub as well.